Rising singing star Spensha Baker made her start in gospel music and now is gaining a fan following in Country Music. Spensha Baker gained a national fan following as she made the finals of The Voice Season 14 TV show on Team Blake. She ultimately took 4th place on The Voice with most of her songs and focus in the Country Music genre. 15-year-old Brynn Cartelli won The Voice honers including the grand prize of $100,000 and a record deal. The night was a big win for “The Voice” newcomer Kelly Clarkson, who served as Cartelli’s coach. Kyla Jade took 3rd place and Britton Buchanan landed as runner-up. How old is Spensha Baker? Spensha is 25 years old and was born January 18, 1993. Where does Spensha Baker live? Spensha’s considers her hometown as San Antonio, Texas and she currently resides in Boerne, Texas. Spensha was born in Hampton, Virginia. How tall is Spensha Baker? Spensha is 5′ 7″ tall. How much does Spensha Baker weigh? Spensha reportedly weighs 126 pounds. What is the nationality of Spensha Baker? Spensha was born in America and is of African American descent. Who are Spensha Baker’s parents? Spensha’s father (Wayne Baker) served in the Military for Army and her mom as served in the Army and currently serves as Spensha’s manger. Spensha’s mom is a major inspiration and is pictured below. Has Spensha released an album? Spensha released “Outloud” as her first album for Geffen records in the Gospel genre. She has released three singles including: 2007: “Purpose”, 2008: “Hallelujah”, and 2018: “Old Soul”. When did Spensha’s singing career begin? Spensha starting singing at home at age 7 and her mom recognized that she had a special talent. Spensha got her first break competing on Star Search at age 12. Ron Fair, Geffen Records Chairman served as a judge on one of the Star Search shows. He was impressed with Spensha and called her at home to offer Spensha her first record deal. At 12, Spensha released her first gospel record with Interscope and toured the world. After her deal ended, Spensha moved to Nashville with her mother, where country music sparked her interest. The pressure of the industry caused Spensha to move back to Texas and take a break from pursuit of her music career. Her mom encouraged her to audition for The Voice and it is likely that The Voice performance results will provide a career opportunity in the Country Music space. What song did Spensha sing for her blind audition on The Voice? Spensha performed the Beatles song “Blackbird”. Both Blake Shelton and Kelly Clarkson spun their chairs and Spensha chose Blake as her coach given her desire to focus on Country Music. 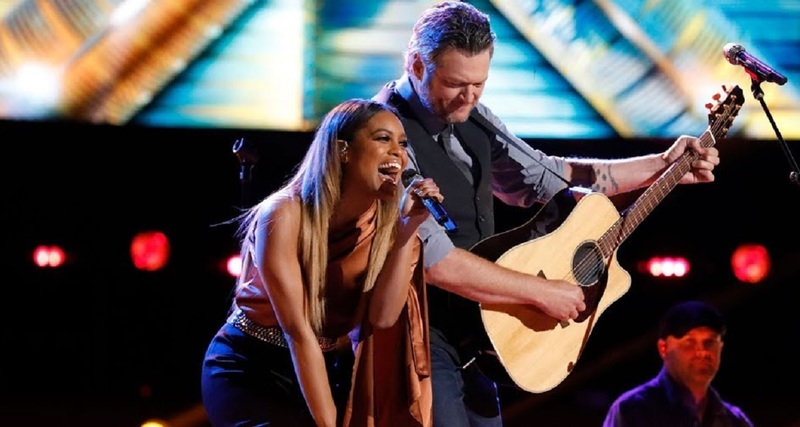 Watch Spensha Baker and Blake Shelton sing Tanya Tucker’s “Tell Me About It” during the first night of the live finale.